Advances in science and technology play a crucial role in the context of peace, conflict and security. As information technology (IT) is becoming omnipresent, this includes both the resilience of IT infrastructures e.g. as a target in cases of conflict and the role of IT applications to prevent and manage conflicts, crises and disasters. This chapter is an introduction to IT and its role in war and peace, in conflicts and crises as well as in safety and security. Based on those connections a new field of research has emerged: IT peace research. 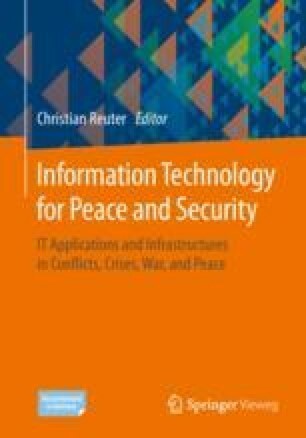 It is introduced in this chapter which provides an overview of the interdisciplinary concepts of peace, conflict and security. In addition, the research disciplines computer science and peace and conflict studies as the basis of IT peace research are explained. Moreover, the chapter focuses on the specific research topics of IT peace research and presents the institutionalised research landscape in Germany.